Precontact Mi'kmaq were a hunting-gathering people who were well-adapted to the natural world. They knew how to hunt, fish, and harvest their own food, how to build their own shelters, make their own clothes, and manufacture a wide variety of tools, weapons, and other implements. Extensive knowledge of the natural world was essential to Mi'kmaq survival. They had to time their hunting strategies around the migratory and spawning habits of fish, mammals, and seabirds, and to recognize which plants were edible, which were poisonous, and when they would be in season. Herman Moll Map, ca. 1747. Precontact Mi'kmaq harvested resources in the Gulf of St. Lawrence and most surrounding land masses. These included Nova Scotia, Prince Edward Island, and parts of New Brunswick and Quebec. To harvest different resources as they became available, the Mi'kmaq moved seasonally from one part of their territory to another. They often spent the warmer months near the coast to exploit rich marine resources and shifted further inland during the fall and winter to hunt land mammals. 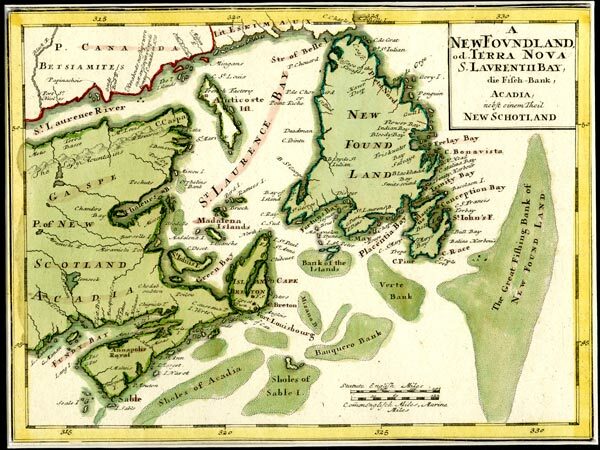 Their precontact homeland bordered the lower half of the Gulf of St. Lawrence and included Nova Scotia, Prince Edward Island, and parts of New Brunswick and Quebec. Some researchers argue it may also have included southern Newfoundland, although others believe the Mi'kmaq did not visit the island until after contact with Europeans. Prehistory is the period of time that predates the written word. It ends at different times in different places – in Britain, for example, it ended with the arrival of the Romans at about 43 AD, while in Newfoundland and Labrador, and in much of the New World, it ended with the arrival of Europeans in the late 15th and early 16th centuries. Prehistory is followed by the historic period, in which written records are available to document human cultures. Without any written documents, our understanding of precontact peoples must come from archaeological evidence – the recovered bones, possessions, and other material remains of past cultures – and from oral histories of precontact times passed down through the generations. While archaeological evidence has revealed much about precontact Mi'kmaq culture, a great deal of uncertainty still surrounds their way of life. It is unknown, for example, exactly how large the Mi'kmaq population was at the time contact, although estimates place their numbers at between 3,500 and 6,000 people. A variety of factors impede the study of precontact Mi'kmaq culture. The acidic nature of Atlantic Canada's soil hinders archaeological research because it destroys organic remains of past cultures. Although researchers have unearthed many stone artifacts, it is possible that less resilient items have decomposed and remain unknown. Further, some precontact Mi'kmaq inhabited coastal regions that have since sunk into the sea or eroded away; important artifacts may today lie buried in the ocean floor. Although much is known of precontact Mi'kmaq society, it is important to remember that archaeological evidence may only provide a partial picture of this precontact culture. Precontact Mi'kmaq harvested resources in the Gulf of St. Lawrence and most surrounding land masses. These included present-day Nova Scotia, Prince Edward Island, eastern New Brunswick, and part of Quebec's Gaspé Peninsula. Mi'kmaq oral tradition states the group also used parts of southern Newfoundland before first contact, but some researchers argue the Mi'kmaq did not permanently occupy the island until the 1760s (Bartels and Janzen 1990). Charles Martijn, however, suggests the Mi'kmaq were already using land in southern Newfoundland at the time of contact. He argues they “once had a unified vision of this traditional homeland, whose eastern section constituted a domain of islands linked, not separated, by stretches of water, like the Cabot Strait, which served as connecting highways for canoe travel” (Martijn 2003). The Mi'kmaq practiced a seasonal round of resource harvesting that typically brought them to the shore in the spring and summer and to inland areas during the fall and winter. They arrived at the coast in the early spring, when the ice was melting and fish were plentiful in rivers, streams, and inshore waters. Winter flounder was one of the earliest fish to become available, and was followed by a string of other species until the early fall – smelt, herring, salmon, sturgeon, trout, cod, bass, plaice, and eels. Fishers employed a variety of methods. They set loosely woven baskets in rivers and streams to act as nets and also built stone weirs (underwater fences or dams) to corral fish. They fished with bone hooks as well as with spears and a three-pronged leister able catch salmon, sturgeon, and other large species. The Mi'kmaq also harvested shellfish, sea mammals, seabirds, and their eggs during the spring, summer, and early fall. The Mi'kmaq retreated inland in the fall to hunt moose, beaver, bear, otter, caribou and other mammals. They killed large animals with harpoons or with bows and arrows and set snares for rabbits, partridges, and other small animals. Hunters sometimes used dogs to help track animals and prevent them from escaping. Snowshoes allowed the Mi'kmaq to travel with relative speed during the winter and to overtake larger mammals struggling through deep snowdrifts. The hunting season typically ran from October until mid-March, when the Mi'kmaq returned to the coast to harvest marine resources. Seals whelped in coastal areas in the early winter, and the Mi'kmaq sometimes returned to the shore in January and February to harvest these animals with harpoons. Precontact Mi'kmaq were skilled at making their own clothing, dwellings, transportation, weapons, tools, and other implements using the raw materials they harvested from the physical environment. They built tents out of wooden poles, which they covered with birch bark sewn together with spruce roots. Summer tents were typically conical in shape, while winter tents were wider and longer. Fir boughs, animal furs, and woven reed mats served as floor coverings, while a central fireplace provided warmth and light. Women made a variety of clothing out of animal skins, which they sewed together with caribou sinew and bone needles or awls. Summer attire generally consisted of skin leggings, sleeves, moccasins, and either a loincloth for men or a frock for women. Fur robes and hooded parkas provided extra warmth in the winter. Mi'kmaq people sometimes decorated their clothing with shells, porcupine quills, and dyes made from red and yellow ochre, charcoal, and ground-up shells (which produced a white dye). Precontact Mi'kmaq built canoes using cedar frames and birch-bark shells. These vessels were of varying lengths (typically between 5.5 and 8.5 metres) and resilience – some could make only short voyages along rivers and lakes, while others were sea-going vessels able to cross long distances carrying entire families and their possessions. For winter travel, the Mi'kmaq made snowshoes out of wooden frames and animal-hide webbing. They also used hand-drawn toboggans to transport heavy loads over the snow. The Mi'kmaq manufactured weapons, tools, containers, and many other items out of wood, bone, bark, antler, and other naturally occurring materials. They made hooks and needles from bone; projectile points from stone and bone; containers and pots from birch bark; kettles from wood; and baskets from grass. Like other precontact peoples, the Mi'kmaq had extensive knowledge of the physical world and were inventive in their use of natural resources. Everything they ate, wore, lived in, and used came from their surroundings.